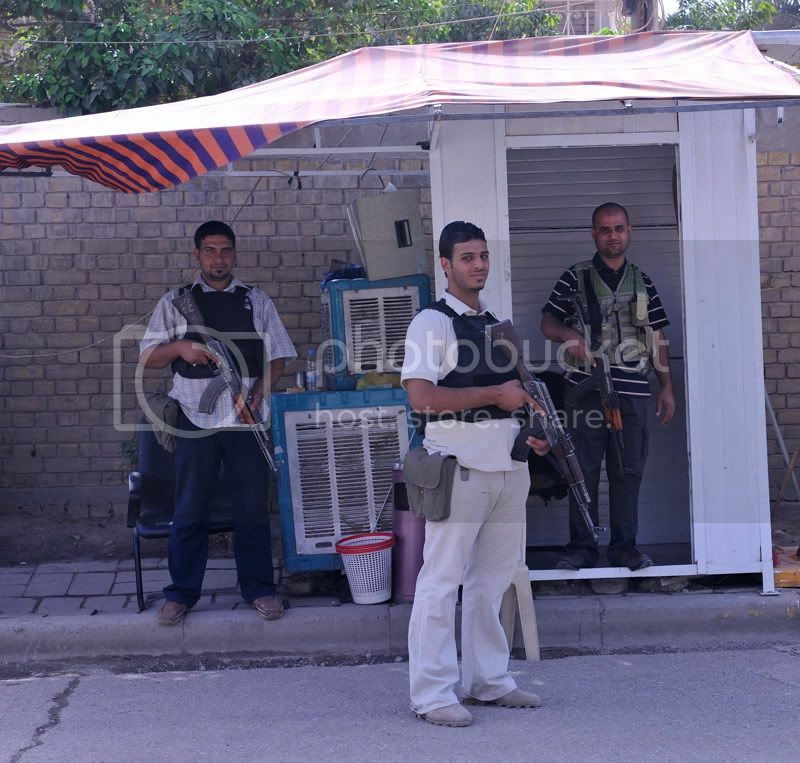 Image taken in the Karrada district of Baghdad. These young men aren't gunmen, but local security team members used in a sometimes volatile part of town. And they do love posing! I've had a request for pictures and a forum of challenged areas. What would you call such a forum. I'd like as to cover peoples struggles but with still hope and not just anti American propaganda. Thanks so much for his image. These guys have a job, salary bring money and hope to their district and that's good. Update! Here we are in the new forum! I've had a request for pictures and a forum of challenged areas. What would you call such a forum. "The Land of Not Quite Right"? Seriously, I think the name you tagged it with is fine. Photography in Iraq is tough. The place itself is not very photogenic, it's this rather drab tan color everywhere. Photographs are grabbed in compounds, enclaves, and other such secure areas. Forget about the street, unless you are behind bulletproof glass and moving quickly. Erbil is the exception- it's in Kurdistan and is relatively safe. I was up there a couple of weeks ago wandering through a centuries-old bazaar but didn't have a camera with me (I need one of those G10's!). A nice document of such a place, and the realities of everyday. They also have there power generators set up. It must be a very noisy city where, even after all these years, electricity is not well organized and people have to resort to polluting generators. Same goes for water, or is that available to everybody in that big city (faucet or bottled)? The below photo shows the generators on the street the guards were photographed on. Electricity is spotty in Iraq. While the water system is intact, without pumps there is no running water in a home- and of course, the pumps require electricity! The air here isn't too bad despite the thousands upon thousands of diesel engines and millions of cars. The air in Kabul is much worse and the utility infrastructure there is nowhere near as good as it is in Baghdad. Very few Afghans have electricity or running water. Very few Afghans have electricity or running water. Sounds like a good thing to fix, and show that these strangers (most in uniform) do bring something good for normal people. But then that's a topic for another forum. Keep these rare glimpses into other cultures coming, I love it. The woman in the distance, the one making those men turn their heads, doesn't seem to be traditionally dressed. Is Baghdad that more liberal than the surrounding countries, or is this a very shielded part of town. 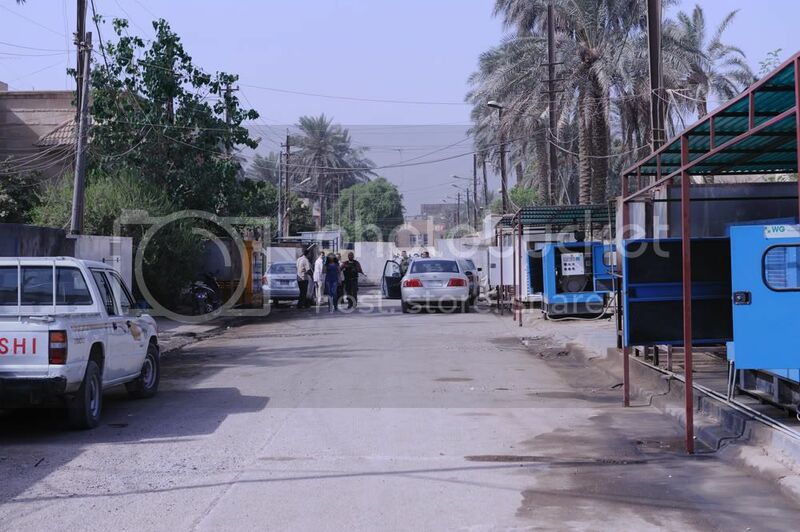 Note the concrete barriers at the end of the street- this area is a compound we use out in Baghdad- not in the Green Zone- and it is entirely enclosed. No one gets in or out without going through security. That said, Iraq is not a terribly conservative place on the whole. Places like Najaf tend to be traditional, but Baghdad not so much. The woman in the photo is a co-worker, she is from Mauritius originally but is a US citizen. She isn't Muslim. The men around her are security. Out in Baghdad proper- even in this enclave- if she, I, or any other expat walks from one building to another we are accompanied by at least a couple of armed guards like the guys in the first picture. In Afghanistan, if out in Kabul, I would wear a headscarf- it's the polite thing to do, and I'd get treated better for it. I wouldn't bother with one in Iraq. Jordan is much the same- not terribly conservative at all. Kuwait is more so, and in the Emirates most Arab women are veiled although they are for the most part wealthy and rarely seen. The Saudis won't let single women in, so I can't comment on that place but it's not on the list of places I would want to visit anyway!